> SEO > How do I get sitelinks to appear in my site’s search results? How do I get sitelinks to appear in my site’s search results? Please Note: We have now published a more up-to-date version of this article: What are sitelinks and how can I get them? The first thing I had to figure out when asking this question was, what the heck do you actually call the links that appear under the main URL when searching for a brand or a publisher? 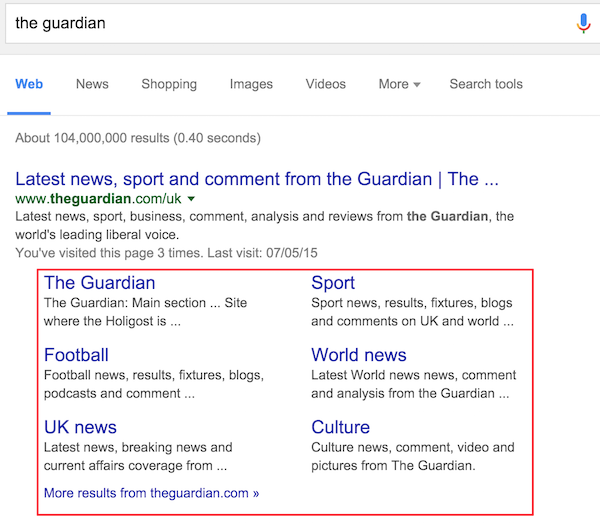 These links are called sitelinks, not subheadings or subcategories, or ‘guys’ apparently. To be honest this has improved a little since the last time I ego-surfed, but the sitelinks represented by the results above aren’t necessarily the ones I would choose myself. I would prefer to see the main, most popular categories on the site (movies, music, food, travel) rather than a few subcategories and an about page seemingly plucked at random. But then if we were all free to choose the way we appeared in search, we’d probably be doing something very different with our lives right now. So, how can I change the sitelinks? Can I actually change them? Is there something I missed when building the site (*cough* moderately adapting an existing template *cough*)? Why would I even want sitelinks to appear in the results? You mean, apart from the pure aesthetic joy of seeing things well-organised and labelled? Well, for a start the more sitelinks you have appearing under your result, the more it pushes does tangential results about you (a Wikipedia page, a news item about some terrible social media faux pas you made). It will also push down any possible competitor results that may appear. That being said, a searcher will only see these results if they do a brand-name search, therefore the chances of a click-through to your site is relatively high. However if you happen to be Nike, dominance of a SERP using sitelinks on your own ecommerce site is particularly handy, as of course Nike products can be purchased from many different retailers. Can I change the sitelinks? You have very little control over how these appear. According to Google itself, “We only show sitelinks for results when we think they’ll be useful to the user.” So there’s an algorithm that decides which ones appear, and even whether they appear at all. I guess I should be lucky I have the ones I have. I don’t exactly know why you would particularly want to do this, unless your contact page happens to feature a list of known serial killers and for some reason you can’t go in and edit the page. In the ‘for this search result box’ complete the URL for which you don’t want a specific sitelink URL to appear. In the ‘demote this sitelink URL box, complete the URL of the sitelink you want to demote. That’s it. Go and have a chocolate biscuit. Google doesn’t guarantee that demoted URLs will never appear as a sitelink, but it will ‘get the hint’. Unfortunately this is still the opposite of what I wanted to achieve. Surely there must be something I can do on the site to make my categories appear properly (i.e. the way I want them to! Sorry, if I’m coming across as petulant here). Seriously, can I change the sitelinks? There are things you can do to increase the chances of your preferred sitelinks appearing in search. And mainly it’s the kind of things you should be doing anyway if you want to make your site easy to navigate for visitors. An XML sitemap is a document hosted on your website’s server that lists every page on your website. It makes it easier for search engines to crawl and index your site’s content. If you have a WordPress site, you don’t need to anything though as a Sitemap is automatically generated and regularly submitted to search engines for you. If you need to make your own, here are some formats and guidelines that will help you. Again, there’s no guarantee that sitelinks will appear after you do this, but it will certainly help. There are a few other things you can do too, although bear in mind (again) that the following are no guarantee of sitelinks, but they will hopefully ensure search engines can crawl your site quicker and more accurately. When using internal links, use anchor text and alt text that’s informative, concise and avoids repetition. Make sure that your site has a clear and logical hierarchy. Include only your most important categories in the main menu. Use relevant and descriptive meta descriptions. Stay away from rubbishy thin content. Try and improve your site’s speed and page load times. So yeah, all good general SEO best practice stuff. Now I just have to figure out how to get the searchbox to appear.